Lifelong runner Kelly May challenges herself for the race of a lifetime with results that were beyond her dreams. As the saying goes, dogs are man’s best friend. But let’s be real: dogs are every person’s BFF. For Kelly May, her 13-year-old Beagle, Hampton, had seen and comforted her through everything. “He’s my rock,” she says—through relationship ups and downs, a divorce, a layoff, and other life changes. In a similar way, running also had kept Kelly strong through the years, both emotionally and physically. “I started running as a pee wee in New York City, and have taken hiatuses from it over the years, but I always end up running again,” she says. 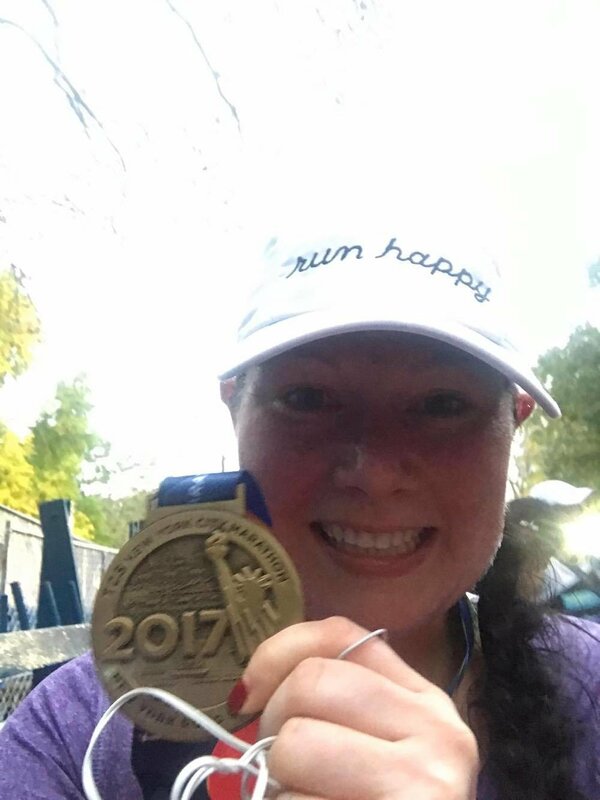 “It is such a comfort to me.” Kelly’s two loves came together recently when she ran the New York City marathon for the first time while raising thousands of dollars for a cause close to her (and Hampton’s) heart. Not long ago, Kelly was horrified to learn that beagles are often used for lab testing. After cleansing her home of products linked to those tests, she wanted to do more. That’s when she submitted an application to, and was accepted as, a runner in the New York City marathon to benefit the Beagle Freedom Project, which works to end animal testing. Although she had completed many half marathons and one full marathon by training herself, Kelly knew this time, she needed professional coaching. She turned to Bodies By Burgoon, signing up for Torque cycling classes and the gym’s virtual training program. Kelly began another 26.2-mile training in January, after completing Grandma’s Marathon in Duluth in 2016. This time, she wanted to train with professional guidance, so she combined customized workouts from Bodies By Burgoon, ran regularly with the Minnesota Distance Running Association, and took Bodies By Burgoon Torque spin classes to maintain variety. Kelly raced in the Twin Cities Marathon just a month before taking on New York. Back in New York (where she lived until her family moved away when she was 7), Kelly stood on the Verrazano-Narrows Bridge on Staten Island with more than 50,000 other runners on November 5. The start of the race was emotional, Kelly says, having listened to the national anthem followed by Frank Sinatra’s “New York, New York.” The crowd, including her fiancé, Eric, her mother, stepdad, aunt and cousin, was a blur as she took off with the excitement and sights and sounds of the city all around her. She recalls thinking about her father, who passed away 25 years ago, looking on her from above, and when the miles grew longer and hills steeper, she thought about everyone who had supported her. “I wanted to walk, but I kept pushing myself and didn’t walk once,” she says. Weekly workouts are personalized and delivered through an app that links to a Polar or Garmin heart rate monitor. The 12-week program includes goal-setting consultation, food log and nutrition guidance and support, and 24/7 email support. Find more information here. The program, run by the Los Angeles Animal Rescue, Media, and Education (ARME), negotiates with laboratories worldwide to secure the release of dogs and other animals to give them a chance at a normal home life. The project has long-term goal of an end to animal testing altogether.